In my haste to get the 'Wing back together I ignored the fact the brake lights were blinking whenever I turned the bike on and now I'm afraid I'm going to need to take it all apart to find the cause of this problem. The PO didn't have the modulator installed but has stated the trunk brake lights are supposed to blink three times when the brakes are applied and then go to solid and the saddlebag lights are just regular brake lights. It also appears the saddlebag lights are only functioning as running lights. Now it is possible both saddlebag brake lights have burnt out, or were replaced with single element bulbs for some odd reason. Guess I'll figure this part out when I remove the lights and check them. I am ruling out the brake light switch, because the lights should change to solid after a few blinks but they continue to blink even after the brake is applied, which is why I'm thinking it is the modulator being faulty. If my hunch is correct which wire should I follow to find the modulator? According to the wiring diagram my choices are Brown; Solid Green; or Green/Yellow. If I'm wrong how should I proceed? Oh by the way what I lack in mechanical skills I make up for with double dose of electrical ineptitude. Which means this part of the project will be even more challenging than the winter maintenance project. First, may seem to be a nitpick but brake lights have flashers not modulators. A modulator reduces from full power to partial power and is inactive in low light. Brake light flashers do not have this capability. Important to keep the nomenclature correct to help people understand what headlight modulators do and why they are legal. First thing, like everything on the GL1500, is to pull the seat and look for things that don't look original. 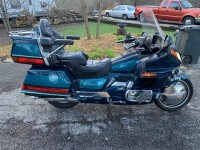 OEM GL1500 has two brake light bulbs in the trunk and two lower on the rear of the saddlebags as you describe. Sounds as if a flasher has been added after the cable splits for trunk and bags. Most likely place is inside the cover on the bottom of the trunk where the release levers and the helmet hooks are. There are about 10+/- screws that go up from the bottom that hold this cover on. Most likely there is a rat's nest of ten different owner's changes to the wiring. The lights are not too hard to get out so it might be worth checking those bulbs first but sounds like you want to pull the flasher anyway so that will take some searching to find. Thank you for the correction/clarification. The only thing that didn't look original was the wiring for the nice little green lights a way back previous owner added. I did trace those wires they are black and red and much smaller than the wires for the brake lights and never intersect with the brake light wiring. Thank you I will look in this area and let you know what I find. I have already pulled the lights from the trunk and both filaments are fine, haven't gotten to the saddlebag lights yet. The yellow circle area has a small fuse box? for the add on lights. I don't think these are involved with the brake but it might be. Andy I'm confused . Not to hard to do so don't feel bad . The release levers are these the ones to release the helmet hooks or the release levers to open the trunk and saddlebags? I'm looking at the outside bottom trunk cover and only see 4 recessed screws, are there more hidden by the saddlebags, or am I working from inside the trunk? So, memory is the second thing to go. Seem to remember more than four. You were in the right place looking up at the levers for the trunk and saddlebags, above the license plate, they are in those recessed holes and have JIS/phillips screws. Those screws are uncooperative going back in BTW. Also the front end of this cover has two tabs that slide forward so once the screws are out, pull it down and then back to take it off. Is hearing the first? My wife ways says I told you and I say I didn’t hear you. .
What where we talking about? Got it, remove the outside trunk cover, pull out the flasher and swear numerous times while replacing the screws. Thanks Wingdings, I'll watch the video but I don't recall seeing anything like that when I was working on the bike over the winter. However I think I solved the problem. 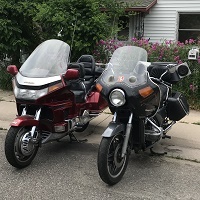 After pulling off the trunk cover and testing the wiring and the flasher and pulling off the fancy green lights around my saddlebags so I could check the lower brake lights, it was discovered the issue the whole time was my impatience with the brake light switch. A few more extra turns stopped the blinking and turned off the second filament on the saddlebag brake lights. Tapped the brakes a few times to fine tune the switch and the problem was solved. In addition my son was looking at the flasher and said he didn't see anything that would cause the flasher to count three blinks and then go solid, no evidence of a modulator. He said it was a typical old school flasher (1990's) that blinks as power runs through it and doesn't stop blinking until the power is stopped. Patience is a virtue and I lost it in my frustration, oh well, I learned how to remove the trunk cover and what I'll need to do if I ever need to replace the lights in the saddlebags. I will also get to work on my soldering skills since I needed to cut the wires for the little green lights so I could slide them out of the track. Maybe I'll splice in an extra 10 feet of wire so I don't have to keep splicing the line. Cheers all and have a great weekend!! I had to cut the wires and pull these out of the track and take the track off to get at the screws holding the lower saddlebag covers in place.